Pure Talalay Bliss Natural Talalay Latex supports your head with uplifting bottomless support and pressure relief. Why Sleep On A Latex Down Pillow? Being relaxed and comfortable is the secret to a great night of restful sleep. Sleep seekers spend a small fortune on new mattresses but overlook the most important part, the right pillow. It doesn’t make sense to support every part of your body except your head and neck. The Pure Talalay Bliss Low and High Profile Latex Down pillows give the neck and head that much needed support. It doesn’t matter if you are a back, side, or stomach sleeper if you love a medium soft pillow, one of these two pillows is for you. It minimizes the most pressure possible letting the head rest in a way that makes it feel like it’s floating. This is because of the natural uplifting support from natural latex. Instead of smothering the head and being enveloped by the pillow, it gently lifts your head in way that makes it feel as though it’s floating on air. Choose from our 6″ thick or 4″ thick models. Remember back sleepers, a pillow that is too big can shift the head forward in way that the chin is driven into your chest. This may be putting your body out of proper alignment. Stomach sleepers be careful to choose a pillow that won’t raise your head up so much because it can create issues described as a stretching pain sometimes felt in the lower back and neck. During shipment our pillow is compressed and will initially look smaller than the measurements listed above. 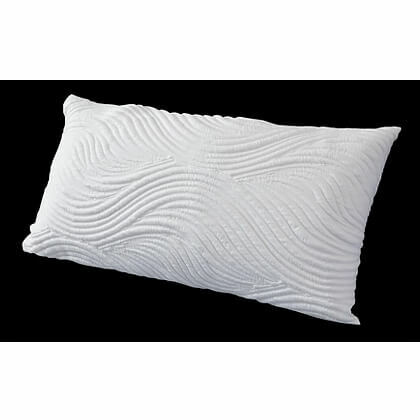 Once opened the pillow will expand and can be fluffed to original shape instantly.